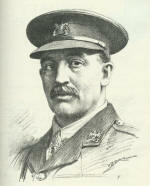 Sir Muirhead Bone was an official British war artist during World War One. Although having trained as an architect Bone instead sought employment as an etcher and artist in watercolours. Born in Glasgow, Bone took up residence in London in 1901. An accomplished Scottish engraver and artist Bone joined the British propaganda war effort in May 1916 (immediately prior to the Somme Offensive), following recruitment by the head of the War Propaganda Bureau Charles Masterman. For the purpose he was given an honorary commission as Second Lieutenant. For all that Bone was a prolific artist, producing several hundred drawings and noted for the detail of his drawings (much reproduced in magazines given that they tended to look equally as well when published in black and white), he only visited the Western Front twice. Bone was knighted in 1937 and again served as a war artist during the Second World War.